Nothing beats the experience of traveling to new and fascinating places. You get to visit amazing landmarks and vistas, enjoy nature at its core, meet interesting people, and learn about different cultures. However, one of the biggest hurdles for travelers is definitely luggage (and packing in general). Some travel light – which makes the experience easier – but what about those who need to bring a month’s worth of clothing? Sure, a standard luggage piece or suitcase might suffice, but both are often bulky. Bringing these bigger storage pieces everywhere you go can get quite tiresome. This is where compression bags come into play. They’re an affordable, lightweight, and efficient alternative to the traditional piece of luggage. Sea to Summit is very well-regarded among travelers because they offer an extensive line of well-made, affordable gear. If you’re looking for a sack that’s simple and durable, you should definitely check out their “Ultra-Sil” model. This particular bag comes with your standard compression pack features – 4 straps for evenly-distributed compression, a pull handle on the bottom of the sack, and bar tack reinforced stress points for that extra bit of durability when you really need to fill up the bag. The Ultra-Sil is made of 30D Diamond Ripstop “silicone impregnated” Cordura, which is a fancy way of saying that Sea to Summit made this thing as durable, light, and water resistant as possible while maintaining a practical balance between the three qualities. You can grab a 6L sack all the way up to a 30L sack as well, making this Sea to Summit unit well-suited for all of your compression needs. Clothing, sleeping bags, smaller tents, tarps…you won’t be let down by this sturdy little sack. One of the most common uses for stuff sacks is storing bulky sleeping bags while on the move. To that end, no sack surpasses the versatility that ALPS Mountaineering offers with their popular compression bag. This pack comes well-equipped to handle even the most unwieldy of sleeping bags. If you’re worried about putting too much stress on the fabric, don’t – the bag is made out of a durable (but lightweight) polyester ripstop fabric and features double stitched seams, reinforced (bar-tacked) stress points, and a sturdy carrying handle. Part of the reason this sack is so well-liked is because it does come with a few extra “frills” that you won’t find on more basic compression bags. The ALP comes with a sturdy bottom handle like I mentioned, along with several d-ring clips and an extra zippered pocket on the top lid. The d-rings especially make it a fantastic choice for roughing it out there with a sleeping bag, as you can clip it to a larger main pack, or you can clip whatever else you need to the compression bag itself. You can grab the 35L (XL) model if you have a larger sleeping bag – it will fit like a glove! The issue with most compression bags is that they come in various cylindrical shapes – this isn’t always the best for clothing storage. Luckily, Osprey read my mind and decided to release a line of rectangular compression sacks. Out of ever sack, pack and bag I’ve tried, this Osprey StraightJacket model has provided me with the best clothes packing experience by far. It’s honestly shaped more like a tote than anything else, but one that happens to compress fantastically as well. 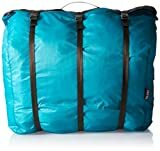 This awesome bag is made of 40D coated ripstop nylon fabric, which means it’s durable, lightweight, and surprisingly water resistant once it’s all packed up. It utilizes two nylon “wings” (except for the 32L, which has 3) and standard clip buckles in order to maximize compression as well as make room for additional gear if you’re traveling on the heavy side. On the top, you’ll find a delightfully placed, sturdy carrying handle. I easily fit a week’s worth of shirts, pants, socks, and underwear into a 32L StraightJacket bag, and everything compressed perfectly. I will say, though, that this is not the best option for sleeping bag storage. The rectangular shape works wonders for clothing or towels and such, but standard cylindrical compression bags accommodate sleeping bags much more readily. This one’s a no-brainer. There are some products out there that are just a cut above the rest, and that’s the case with Earth’s waterproof Earth Pak sack. The Earth Pak is constructed with 500D PVC material – this thing is incredible durable. Thinner PVC often has abrasion issues after extended use, but that’s simply not the case with this bag. It’s utterly air-tight and waterproof via a roll top and buckle closer, and I’ll honestly be surprised if I run into any rips or tears within the next few years of frequent use. The 10L and 20L models come with a shoulder strap that’s a welcome choice, as it lets you carry the bag essentially however is most comfortable to you (across your back, across the chest, over one shoulder, etc). The 30L and 40L models come with standard backpack straps. Earth’s also included several d-rings so you can easily clip this pack into the rest of your gear. As an awesome extra, the Earth Pak comes with an IPX8 certified waterproof phone case that fits any phone measuring up to 6.5 inches diagonally. I don’t know about you, but I’ve run into plenty of “waterproof phone cases” that turned out to be…not waterproof. Well, I happened to have an old Moto X lying around, so I stuck it in this phone case and tossed it in my tub for 15 minutes. I pulled it out, dried the case off, and the phone was 100% dry. Color me impressed. On the subject of testing, I did the same thing with the pack – I loaded it up with a camera, some clothing, and a towel, closed it properly according to Earth’s detailed instructions, and submerged the whole thing in my tub for a few minutes. Again – everything was totally dry when I took the sack out and opened it back up. 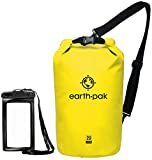 I could go on, but I’ll put it simply – if you want an affordable, 100% waterproof compression bag that’s backed by fantastic customer service, you won’t do better than this Earth Pak. This Outdoor Research Ultralight sack is another great all-around option, but I was very pleasantly surprised by how well I was able to pack a smaller 3-person tent into it. 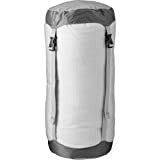 The largest size is 35L so you obviously won’t be able to cram a mega tent into the bag, but for one, two, and three person tents the Ultralight sack should do the trick perfectly. One of the main considerations when packing a tent is how durable the pack sack is – I’ve had tent equipment burst through plenty of bags in my backpacking experience. Luckily, Outdoor Research built this sack with 40D ripstop silnylon fabric which is both durable and lightweight. The end caps were also made using bound seams, meaning all of your obvious pressure points are well-reinforced. The bag utilizes four compressions traps (with a drawcord closure), which is a big help when compressing something bulky like a tent. It’s very easy to distribute the compression evenly throughout this pack. As a small extra, the bag does come with a pocket on one end – I’ve found this the perfect place to store smaller bits and piece of tent hardware when necessary. What are compression bags? These are sacks or bags made from high quality nylon (and other similar materials) that you use to store your clothes, sleeping bag, or other personal effects. You then use a tab that you pull, this forces the air out of the bag making sure that there will be no wasted space within the travel bag. Compression bags are all about making your luggage as compact as possible. This is an essential feature if you wish to travel with carry-on baggage as it ensures your luggage is as small and compact as possible. This is also a great option for those who love camping and staying outdoors. Tip: If you want to stay extra comfy while on the road, travel pillows and compressible bags often work extremely well together – travel pillows compress very easily and add some quick comfort to your journey! Before going to your local outdoor specialty store to buy a compression sack, you first need to determine what kind to choose. Depending on your needs, you will need to choose between different types of compression bags. The best type of stuff sack is specifically those that help save space. High quality compression bags use tough durable material. Mostly made of tough nylon or other similar materials. They can be used to store clothing as well as bulky sleeping bags. It also features external dividers and straps to help you organize content and use space within the bag efficiently. Compression bags or sacks are designed to be extremely compact and lightweight, they are also a bit more expensive. As expected on the name, these compression bags are waterproof and are best used when traveling outdoors. The best option for canoe and kayak lovers, seafaring types, and those who like to fish while traveling, these compression bags utilize urethane coated material or PVC to ensure that that your items stay dry. It also uses a roll-up closures to ensure that it’s airtight. It will also float if dropped in the water. For outdoor activities, I recommend you get one that uses silnylon fabric (a combination of silicon and nylon) as it is waterproof and extremely lightweight. Your basic option, these are often used to help store clothing and essential outdoor gear such as first aid kits. It often uses waterproof nylon fabric and uses pull-on string closure. Pretty basic stuff. The string closure means that it will not provide the same compact look as high grade compression sacks. This one is best for use in warmer climate areas. It also comes in smaller sizes – often called the “ditty bag” – which you can use to store your outdoor gear. Once you know what type of compression bag to buy it is now time to know what to look for in a specific product. Not all products are created equal, obviously – for example, you can always save cash on cheaper bags, but you’re never sure how durable they are. If you travel outdoors often then it is best to invest in an expensive, high quality one to ensure its longevity. You get what you pay for, so keep that in mind. The material needs to be tough enough to withstand the natural elements outdoors as well preventing rip and tears. Having one that has waterproof yet breathable fabric is also vital as you would most likely put used clothes in your compression bag as well. Last thing you want is have the smell of used clothes stick to the interior. With those in mind, might I recommend compression sacks that utilize ultra sil-nylon fabric? This material is lightweight, durable and waterproof. It’s easy to clean as well which is a huge plus for outdoor bags. Make sure you read instructions when it comes to cleaning your compression bag though as some are not machine washable. There are handy cleaning tutorials you can find online to help ensure you maintain the quality and durability of the fabric. You should also be aware of the storage limit for each type of bag. Products will state the storage capacity of the bag so make sure you stay within that range. If you pack heavy then go for 30 liters and above, while there are also 10-liter compression packs that you can use if you only bring a handful of clothes on your travels. When it comes to travelling, having the right gear will save you a ton of hassle. A compression sack is helpful when you need to save space or if carry-on size is a factor when travelling. That being said, even the highest quality sack will have a short lifespan if not taken care of properly. Constantly packing your bag to the brim will put tremendous strain on the fabric making it more susceptible to rips overtime. It is best to know when you should use a compression sack and when to use your standard luggage bag. That being said, just follow the guidelines above in order to for you to land the perfect stuff sack for your needs. This is one of those occasions when it is best to invest on high end, tried and tested brands. You should also remember that while compression packs help you bring more stuff with you, it also means you might end up adding more to your luggage weight overall. Be aware of the weight limit when traveling via airline in order to avoid paying extra, and when backpacking in order to save your back added stress! Compression bags are a fantastic start to traveling comfortably and smartly, but make sure you’re filling them with the best travel gear on the market!